Fancy Nancy is a popular children’s book with our first grade students. Author Jane O’Connor’s title character likes to dress in extravagant clothing and use big fancy words. What little girl wouldn’t want to wear a feather boa and a tutu? The other day one of my little girls wanted to read Fancy Nancy with me at my table. We looked at the illustrations and checked out the cover. 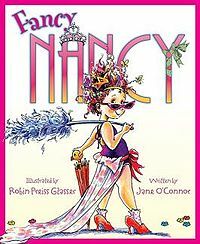 On the back, we saw that several titles in the Fancy Nancy series were featured, with thumbnail images of the covers displayed. My student asked me to read to her one of the titles. “Spectacular…I think I will need to put my glasses on to read this,” I said. The print was too tiny for me to read without my bifocals. I guess I’m a little vain, so I often leave them in their case. This time, however, my eyes were betraying me, and I was going to have to give in. I put my glasses on and attempted to read the title again. “Spectacular…Spectacles,” the title read. We laughed. How perfectly fitting and quite ironic, don’t you think?